The week before last, I had to make an emergency trip to the dentist. Let me just start by saying that before that appointment I hadn't been to the dentist in a VERY long time! :) (So long, in fact, I won't mention it here.) Anyway, I had a toothache that would not go away, so I reluctantly went, and was pleasantly surprised. My dentist was very nice, his chair was comfy, and the exam area had a huge window overlooking a lovely pond. I came out much more relaxed than when I went in. What else can you ask for, right? The verdict was that I need a root canal! (Yikes!) Other than that, I'm cavity free. 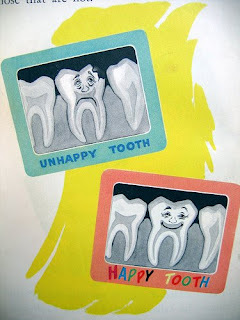 So, I would love to know, how do YOU feel about going to the dentist? I'm like you. I waited a long time in between dentists visits and ended up going when I had a tooth that was giving me too much pain to ignore. I didn't even have a regular dentist, I have to find one (and that is a whole other story...I ended up trying to go to the dentist when there was a convention of dentists in New Orleans and they all were at the convention). The one that I eventually found turned out to be very good. Made things go really easy and didn't hurt me. But I still hate to go the dentist.